Playing off the much loved Boho trend, we adore the celestial inspired weddings in the early stages of 2018. Fitting perfectly in this dreamy theme, these weddings are a mix of elegant, vintage and rustic. This theme is so versatile that it can go from incredibly elegant to a dreamy vibe with ease. What better way to say I do than under the stars? The colors are gorgeous for this theme; deep blues accented with stunning golds or pretty silvers and whites on a backdrop of inky black. Glittering stars winking above your guests gives an allure of beauty to your wedding. A trend of hanging décor is popular this year and stretching the heavens overhead fits right into it. 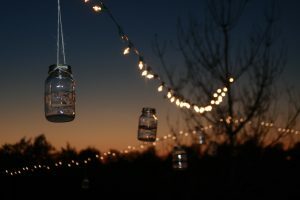 This can be accomplished via literal stars and moonlight, or if your wedding is held indoors with twinkling star lanterns dangling from the ceiling. Inspiration comes from not only the moon and stars but also from astrology. Seating charts featuring the constellations. Table cards depicting their arrangements. Décor showcasing the phases of the moon. Star charts doubling as a guest book. Brides are looking gorgeous, their hair dotted with stars and planets. Be it a simple headband of silvery stars, or a golden tiara shaped into a constellation. Wedding gowns shine with shimmery beading and star shaped appliqué on the runways. Natural makeup plays well into the look where you can add just a hint of sparkle for an ethereal presence. Bridesmaids are stunning in blue. As such a versatile color, it’s flattering on nearly every body type. Varying the shades of blue dresses gives your ladies some choice in their options. Mix and match fabrics and styles for a unique wedding look. The cakes look too delicious to eat! Depicting the starry sky or deep blue and dotted with gold foil, they are beautiful and delicate. For the DIY bride, easy cake toppers of glittery cutout stars and moons are a fun and pretty way to dress up your dessert. Or a handmade star garland can be the perfect accent to dazzle. If you’re looking for an experience that you and your guests will remember forever, setting your wedding during a celestial event can make it feel like it is blessed by the heavens. During the year there are meteor showers, a partial solar eclipse, and a total lunar eclipse in July. A pretty and nature centric way to illuminate your perfect day. Photos are out of this world with this theme. Be it with the night sky behind you or a photo backdrop with an oversized crescent, they are a memory of your infinite love and your one-of-a-kind experience. We are loving lace for this theme and for the month of March, use coupon code LACE15 for 15% off all of our lace dresses! Click here to check out our selection!